All of the ray group are quite dorso-ventrally flat and have their mouths on the ventral side. Being cartilaginous fish, there are no bones at all, the skeleton is completely cartilage. Most rays do not have teeth, as sharks do, but rather have a “bony” plate, top and bottom, with strong jaws. Rays have one or more envenom-mating stingers on their tails. Ray species vary from 10 inches to over 6 feet in width. Rays in general prefer tropical and semitropical waters. Cow-Noses and Southern Rays range from Southern New England south to Florida and into the Gulf of Mexico. The warm Gulf Stream swings up along New England, then across the Atlantic and south by the British Isles … the path of hurricanes. Many warm-water animals follow these warm currents and are found much farther north than one would expect. Warm weather takes the rays north and winter sends them migrating into the Gulf of Mexico (clockwise from Florida to the Mexican Yucatan). Wild – Mollusks, crustaceans and small fishes. Zoo – Fresh-frozen chopped fish and shrimp. The entire ray group – as well as sharks – demonstrates the camouflage called counter-shading. The back is some shade of dark to match the ocean floor, when viewed from above, and the belly is light or white to be bright against the brightness at the water’s surface, when viewed from below. Many, many marine and fresh-water animals demonstrate counter-shading, including orcas, penguins and trout. 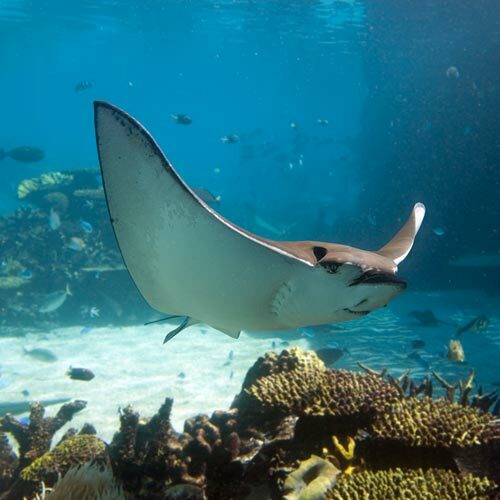 Rays move by undulating their bodies up and down like a wave, or by flapping their pectoral fins like wings. These fins are often referred to as “wings.” When resting, rays lie buried in the substrate, often with only their eyes showing. This can be to the detriment of swimmers or divers who inadvertently step on them. Stepping on the spine or getting stabbed with that spine is immediately quite painful. It is suggested that swimmers, walking on the bottom, shuffle their feet. The rays will swoosh out of the way. Rays often visit the “cleaning stations” of the Bluehead Wrasse (Thalassoma bifasciatum) and the Spanish Hogfish (Bodianus rufus), fish that clean excess mucous from the skin and eat parasites from the skin and gills. Fish visiting these cleaning stations will affect a pose, with the mouth and gill covers open, much like the Galapagos Tortoise (Geochelone elephantopus) does for the Galapa-gos Finches (Geospiza species). The cleaners swim in and out, picking parasites and food particles. A mucilaginous skin coating makes rays (and most fish) slippery, helping them to glide through the water faster. It also protects them from dehydration and helps protect them from invading pathogens. This mucous makes the fish feel very smooth, it is not at all “slime,” like that produced by hagfish (Myxinidae)for predator protection, and the mucous is certainly not dangerous to humans. The subtended mouth allows for easy gathering of prey from the substrate. The large, flat tooth-plates are used to crush the shells of their prey. Soft body parts are swallowed, the crushed shells spit out. A question comes from the presence of this hard tooth plate. How can this be when the fish has a cartilaginous skeleton with no bones? The mechanism has been likened to fossilization. An animal (or plant) literally becomes a rock as soft tissues are replaced by a process of mineralization. Biologist Adam Summers of the University of Massachusetts, Amherst, reports that – somehow – the stingray deposits minerals as a strong coating in and around its jaws. A columnar structure acts as reinforcing struts within its jaw cartilage and a crushing plate is formed. Summers’ discovery marks the first time an animal has been found using mineralization deep in its cartilage for structural purposes. One feature of Stingrays that is certain to draw attention is the “stinger,” the spine (or spines) on the ray’s tail. The stingrays in the touch-tank have had their barbs trimmed — it is painless, like cutting a long fingernail. Ray mating season is usually in winter. Courting males will follow the female closely, biting at her (watch for “hickies” on our rays). During mating, the male swims above the female, placing one clasper into her vent. Ovovivi-parous females have litters, the embryos being kept in the womb without a placenta. Embryos absorb yolk-sac nutrients, and, after the sac is depleted, the mother provides a uterine “milk.” Cow-Nose Rays and Southern Stingrays often give birth in protected Mangroves. Longevity for most stingrays is not known. Diet Clams, oysters, hard clams and other invertebrates. Length Up to 45 inches at maturity. Weight 50 pounds or more. Habitat From Southern New England south to Florida and into the Gulf of Mexico. Of about 700 species of skates and rays, some are facing extinction and some, like the Southern Stingray, are common, IUCN listed as Data Deficient because they have not been recently studied. Cow-Nose Rays are IUCN listed as Near Threatened. A cownose ray has a stinger, called a spine, on its tail, close to the ray’s body.